Glasgow Warriors can still qualify from Heineken Cup Pool 2 and prove Scottish sides are good enough to compete at top European level. So says assistant coach Matt Taylor despite in France. "The boys are pretty disappointed with our first-half display but encouraged by the second half," he said. "We attack well, we defend well and, if we get our game plan right against anyone, we'll play well." Glasgow, who had won their five Pro12 league matches before losing in France, host Exeter Chiefs in their next group game on Sunday and Taylor knows the English Premiership club well having spent a season there previously. "It's a great club in terms of what they are trying to do down there," the Warriors coach told BBC Scotland. "They've got a great culture, coach Bob Baxter's done a great job. "They are a team that work hard for each other, similar to us at Glasgow - we're very similar teams I think having been in both camps. "They have had a couple of good wins in the last couple of weeks, so we have to be at our best to beat them at the weekend." Exeter got their European campaign off to an ideal start by having won their previous game in the Premiership. "We just need to put in an 80-minute performance against Exeter, a very good team who had a very good result at the weekend," said Taylor. "If you look across their team, they have some really exciting individuals, but for me they are a team that work hard for one another and we need to do that too and will be concentrating on what we do well." 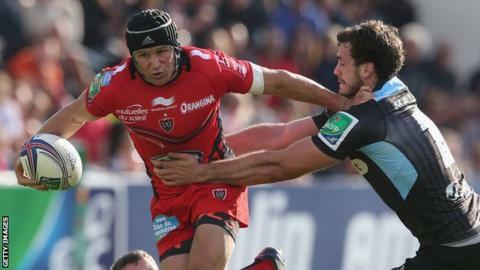 The start to the Heineken Cup was clouded in controversy over plans by English and French clubs to start their own competition next season. They believe that clubs from the Celtic nations receive preferential treatment in qualification. Taylor feels both Glasgow and Edinburgh, who started their campaign with a , have big points to prove about the strength of Scottish rugby. "You always want to prove your critics wrong," he said. "We need to go out and show our consistency on the big stage. "The European Cup is a massive stage and it's one in which the Scottish teams deserve to be involved. "It is a massive step up. You saw at the weekend, we were up against one of the best club sides in the world. "Every team in this competition is a world-class club team so we need to be at our best week-in, week-out. "You've got to win your home games. Certainly at home, we are a very good team."